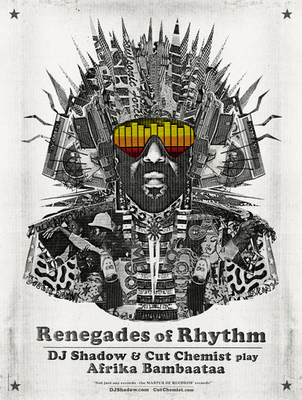 It’s the Renegades of Rhythm Tour with DJ Shadow and Cut Chemist. These world-renowned artists and turntablists are spinning the well-loved and well-worn vinyl from the record collection of the founding father of hip-hop and “Master of Records,” Afrika Bambaataa. This entry was posted on October 20, 2014, 18:32 and is filed under Uncategorized. You can follow any responses to this entry through RSS 2.0. Both comments and pings are currently closed.